This monograph is based on the author's results on the Riemannian ge- ometry of foliations with nonnegative mixed curvature and on the geometry of sub manifolds with generators (rulings) in a Riemannian space of nonnegative curvature. The main idea is that such foliated (sub) manifolds can be decom- posed when the dimension of the leaves (generators) is large. The methods of investigation are mostly synthetic. The work is divided into two parts, consisting of seven chapters and three appendices. Appendix A was written jointly with V. Toponogov. Part 1 is devoted to the Riemannian geometry of foliations. 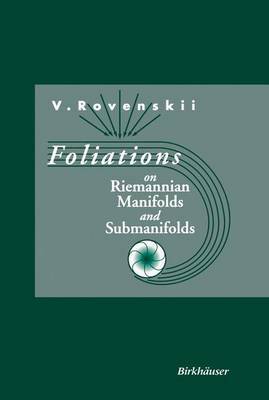 In the first few sections of Chapter I we give a survey of the basic results on foliated smooth manifolds (Sections 1.1-1.3), and finish in Section 1.4 with a discussion of the key problem of this work: the role of Riemannian curvature in the study of foliations on manifolds and submanifolds.